One or more photo(s) has been virtually staged. 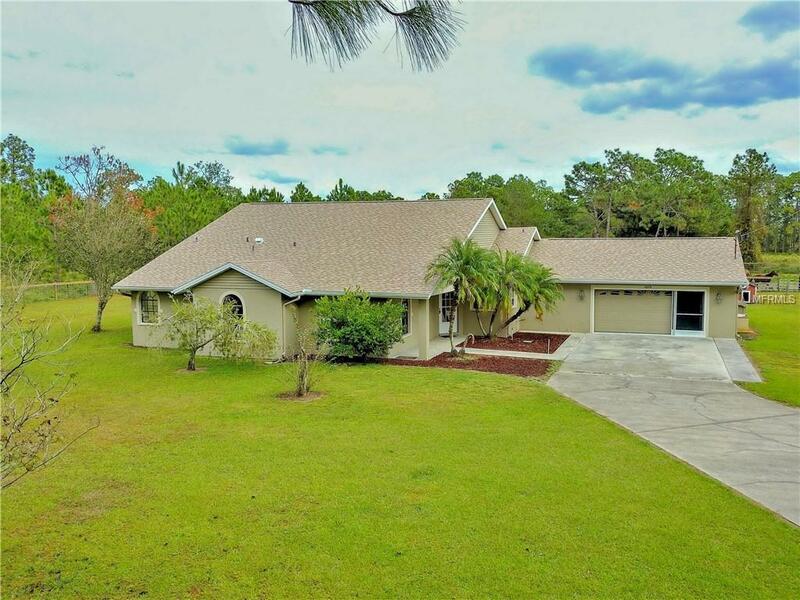 Meticulously well-maintained 3/2/1 home nestled on 2.6 ACRES of SECLUDED countryside! MOVE-IN READY with all the upgrades and space you are looking for. Enter through the front door, you are greeted by a spacious living room with VAULTED CEILINGS and direct views to the pool through the sliding glass doors. Master bedroom suite features VAULTED CEILINGS, DUAL WALK-IN CLOSETS and VANITIES, walk-in Shower and jetted JACUZZI TUB to come home to and relax in. Large OPEN Eat-In KITCHEN adjoins the Dining Room which has lots of natural light and gorgeous views to the pool and backyard. Step outside to the Screened-in Lanai which features a beautiful solar-heated SALT WATER POOL. Tons of outdoor entertainment space under the COVERED LANAI. Upgrades in 18 include NEW ROOF, interior/exterior PAINT and CARPET. Propane powered Dryer, Stove and Hot Water. Backup GENERATOR included! This magnificent EQUESTRIAN ESTATE property is fenced/cross-fenced and ready for your horses and livestock! Includes a 2-Stall BARN with shower stall and tack room. Secured GATED ENTRY and private drive. Excellent A-rated School District of Land O Lakes. Conveniently located off Hwy 41 and close to I75/275 or Suncoast Parkway makes this is an ideal location.